From I-95, take SR 46 west. Turn left onto Turpentine Road, then take a right on Panther Lane then a left on Arch Road and follow Arch Road to the main entrance and parking area. A mixture of upland scrub and wetlands as well as portions of Loughman, Salt, and South Lakes, Salt Lake Conservation Area has a diverse wildlife population ranging from deer, turkey, bobcat, and fox to scrub jays, hawks, egrets, herons, ducks, and songbirds. FROM I-95, take SR-46 Exit-223 west towards Mims/Sanford. Stay on SR-46 for 4.1 miles to Hatbill Road. Turn left and go 8.5 miles to the Hatbill Rd/Baxter Point Rd intersection, keep left and go 0.5 miles to the park. Boat ramp open 24 hours a day. Primitive camping by permit at the park on weekends. Call 321-264-5037 for permit and info. Lake Proctor is 15.5 miles west of Interstate 95 on SR 46, on the North side of the road. The Lake Proctor Wilderness Area is a 475 acre wooded site located in east Seminole County near the Town of Geneva. About 6 miles of trails will take you through a variety of habitats such as sand pine scrub, pine flatwoods, mixed hardwood swamp, sandhill or longleaf pine, turkey oak, bayhead swamp and oak hammock. Wildlife observed on this site includes the wood duck, white-tailed deer, sandhill cranes, wading birds, migratory songbirds, red fox and Florida worm lizard. The trails are open to hiking and mountain bikes. Head south about 1 mile on CR 426 from SR 46 in Geneva. The Wilderness area will be on your left. The Geneva Wilderness Area is a 180 acre site that lies to the south of the Geneva community on SR 426 in East Seminole County. The Geneva site contains an array of native Florida plant communities from Mixed Hardwood Swamp and Mesic Hammocks to Xeric Oak, all supporting an equally diverse collection of wildlife. A hike through these habitats can reward visitors with sighting gopher tortoise, white-tailed deer, wild turkey, grey fox. Take SR 46 to CR 426 in Geneva, south on CR 426 (4.2 miles). Turn right on Walsh Street, then take the second left onto Florida Ave, then the next right on Barr Street, then turn right onto Howard Ave. Park will be right there on left. The Black Hammock Wilderness Area, a 700 acre joint purchase with the St. Johns River Water Management District, was acquired as part of a comprehensive effort to preserve significant habitat along the shores of Lake Jesup. A round trip hike of approximately 4.5 miles of trails will take you through habitats such as Mixed Hardwood Swamp, Sand Pine Scrub and Pine Flatwoods. Wildlife observed on this site includes the Barred Owl, White-tailed deer, Bobcat and Eastern Hognose Snake. The variety of habitats and beautiful boardwalk and trail system makes this park a popular destination for local equestrians (no trailer parking), mountain bikers, hikers, photographers and other outdoor enthusiasts. There are two separate tracts to the The Little Big Econ State Forest, the Demetree Tract and the Kilbee Tract. The Demetree Tract of the Little Big Econ State Forest protects the watershed of one of Floridas most beautiful Blackwater Rivers, the Econlockhatchee, a popular canoeing destination. Along the river one may see wading birds perched in trees, various raptors including Bald Eagles are commonly sighted as well as swallow-tailed kites flying overhead in spring and summer. Woodpeckers and kingfishers are also common sightings. A large variety of songbirds inhabit the forested areas as well as the improved pastureland near the Snow Hill Road entrance. Other sightings may include whitetail deer, turkey, bobcat, otter, alligators, sandhill cranes, and many others. There are three entrances to the Demetree Tract, the Barr Street Entrance, the Snow Hill Road Entrance, which also serves as the Equestrian use entrance, and the Jones East Trailhead Entrance. To get to the Barr Street entrance, go south about 4.5 miles on CR 426 from SR 46 in Geneva. The Barr Street entrance will be on the left. To get to the Snow Hill Road entrance, go south on CR 426 from SR 46 in Geneva. In just under a mile, Snow Hill Road veers off to the left. Go about 2.5 miles south on Snow Hill Road. The parking area will be on the right. The Jones East Trailhead can be found on Snow Hill Road about a half mile south of the Snow Hill Equestrian Trailhead. The Kilbee Tract is a separate tract that straddles the St John's River on the south side of State Road 46, and contains the point where the Econ flows into the St Johns. The trail leads from the Trailhead heading south then forks into two trails. Taking the left fork will bring you to a great vanatage point overlooking the St. Johns River Floodplain. Scan the marshes for waders, ducks, raptors, and many others. The entrance to the Kilbee Tract is off of SR 46, just west of the SR 46 bridge about 11 miles west of the I-95/SR 46 interchange. From Titusville take SR 50 to Fort Christmas Road in Christmas, turn right (North) and follow Fort Christmas for 9.2 miles, turn left on Lake Mills Road and in .8 miles, turn left on Tropical Ave. Park will be just ahead on right. This 50 acre park is located on the shoreline of Lake Mills in Seminole County off of Tropical Avenue just north of Lake Mills Road. There are three areas for birdwatching in the area, a scrub forest, the lakeshore, and a beautiful mixed hardwwod swamp with a little creek winding through the swamp to the lake. From Titusville take SR 50 to Fort Christmas Road in Christmas, turn right (North) and follow Fort Christmas for 9.2 miles, turn right on Lake Mills Road for .8 miles bear right on Curryville Road. The Wilderness area will be on your left in 2.5 miles. The Chuluota Wilderness Area is a 625 acre natural area located in the southeast corner of Seminole County. It contains a variety of natural systems such as mesic hammock, pond pine flatwoods, hardwood swamp and some rare habitats such as sand pine scrub. These in turn provide food and shelter for an equally diverse population of wildlife which includes white-tailed deer, gopher tortoise, sherman's fox squirrel, and the eastern diamondback rattlesnake. From I-95 and SR 50 near Titusville drive west on SR 50 about 19 miles and bear right on Tanner Road S for 1.6 miles. Turn left on Lake Prickett Road, go 0.8 miles, turn right on Tanner Road N for 2.2 miles, when the road turns into Old Lockwood Road you are about there. Entrance is on the right. 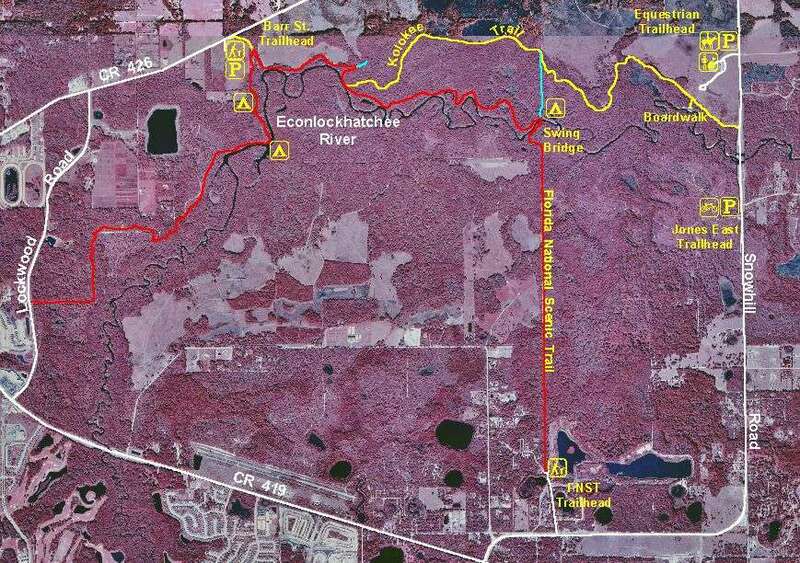 The Econ River Wilderness Area is a 240 acre wooded site located on the Seminole/Orange County line south of the city of Oviedo, on the west side of the Econlockhatchee River. A walk on the approximately 3 miles of trails will take you through habitats such as pine flatwoods, sandhill, and river swamp. Wildlife observed on this site includes the great horned owl, white-tailed deer, and golden mouse. Benches are provided at a bend in the river so you can rest and enjoy the quiet serenity of this little piece of natural Florida. From I-95, take SR 50 west to the town of Christmas. Turn right (north) onto Ft. Christmas Road (CR 420) and go 2.3 miles to Wheeler Road. Turn right on Wheeler and go east for 1.5 miles to the parking area on your left. The Orlando Wetlands Park is a regional wastewater treatment facility for the Greater Orlando Area. The system was designed to polish up to 35 million gallons a day of reclaimed wastewater. The water is conveyed through a four-foot diameter pipeline approximately 17 miles. Seventeen cells and three different communities were designed to remove excess nutrients from the water. Over 2 million aquatic plants and 200,000 trees were planted to create deep marsh, mixed marsh and hardwood swamp habitats. The water flows into the influent structure and is then divided into three flow pathways. The water first flows into the deep marsh. The deep marsh cells are primarily monocultures of cattails or giant bulrush. From there, the water flows into the mixed marsh. Here's a website on how it works to treat wastewater. Wildlife; The open waters of the lake and marshes attract wintering waterfowl, including blue-winged teal, green-winged teal, common moorhens and Amaerican coots. Wood storks, white ibis, black-crowned night herons, and other wading birds are common during the cooler months. Bald eagles, limpkins, and red-shouldered hawks, black vultures, and turkey vultures are year round residents in the Orlando Wetlands Park. Raccoons, river otters, white-tailed deer and bobcats can be seen along the roads and hiking trails. The Orlando Wetlands is home to over 30 species of wildlife that are listed on the Florida Wildlife Conservation Commission’s Threatened and Endangered Wildlife list. This vast expanse of flatwoods and open prairie straddles the Econlockhatchee River in east Orange County. The big attraction for birders here is an active colony of red-cockaded woodpeckers located in the northern third of the property. Best viewing time for the RCWs is at dawn when the birds awaken from their nesting cavities. White stripes around pine tree trunks identify trees with RCW cavities. Other common resident species include eastern bluebird, brown-headed nuthatch, Bachman's sparrow, wood duck, sandhill crane and barred owl. With some luck, visitors may find wild turkey, whip-poor-will, hairy and red-headed woodpecker, hermit thrush, orange-crowned warbler, sedge and marsh wren, king rail and Cooper's and sharp-shinned hawk. Chain of Lakes is a regional stormwater park and athletic facility, containing soccer fields and softball fields. Of interest to birders is a walking trail that completely encircles a large serpentene stormwater retention lake east of the fields. Along much of the eastern shoreline the trail is just off the shore of the lake, allowing a view of waterfowl, wading birds, gulls, terns, and osprey. To the east of the trail at this point is a series of restored salt marshes that are designed to treat stormwater from the lake as it enters the lagoon. There is also an observation tower that allows a panoramic view of the marshes, the park, and the Indian River Lagoon. As the trail extends around the northern tip of the lake it enters a series of restored freshwater swamps, that have been engineered to provide treatment for the stormwater before entering the lake. As the trail travels through these forested wetlands look for many different species of migrant songbirds among the trees. Fox Lake Sanctuary is a 2,800 acre property owned by the Brevard County Environmentally Endangered lands Program and has recently opened to the public via a trailhead located near the boat ramp of Fox Lake Park west of Titusville. 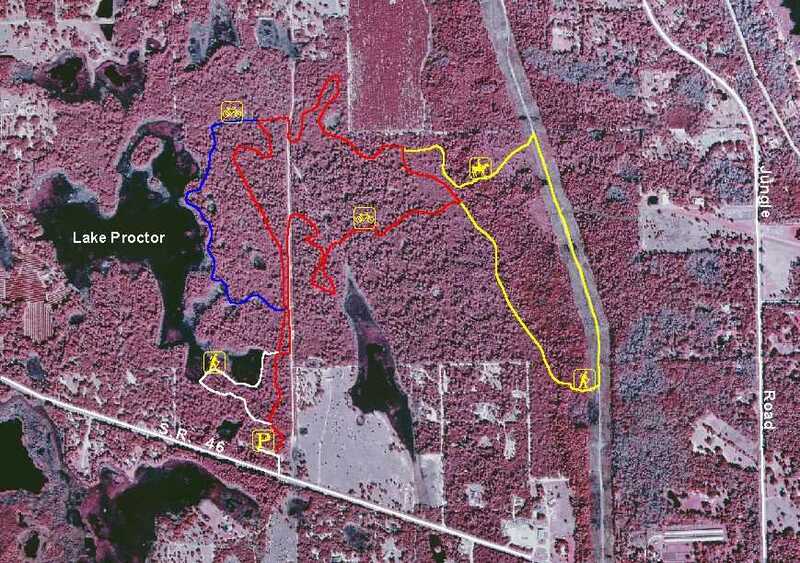 Roughly 7 miles of hiking trails provide access throughout the property while a marked Canoe / Kayak trail connects Fox Lake to South Lake to the North. Wildlife found on site includes White Tail Deer, Hogs, Migratory and wading birds, raptors, wild turkey, and on at least two occasions the EELs program was suprised to find motion activated cameras tripped by Florida Black Bear. The sanctuary contains a variety of habitats such as scrub, pine flatwoods, oak hammocks, depression and freshwater marshes. is found on the corner of Holder and Dairy roads in Titusville. About 6 acres in size, it is a preserved section of Atlantic Coastal Ridge pine scrub habitat with about a half mile trail looping around the outer parimeter and other trails through it. Located atop an ancient sand dune, this type of unique habitat is rapidly being bought up by developers in Florida and is probably the most endangered habitat in the state. It is dominated by tall slash pine trees and a lower growth of scrub oak and saw palmettos. Nice 1/2 hour or so hike and lots of songbirds during migratory periods. Fox Lake Park is a 37 acre recreational park with picnic facilities, vollyball courts, a large pavillion with a stage, a boat ramp and fishing dock on Fox lake. (My largest largemouth bass I ever caught came while fishing right off this dock, 7.5 lbs.) It is also the home of the Fox Lake Bluegrass Festival as well as several other festivals throughout the year. Putting in a boat, kayak, or canoe provides access to not only the whole of Fox lake, but to South lake through a canal connection between the two. Wading birds such as egrets and herons can be seen here as well as american coots, gallinulles, osprey, limkin, sandhill cranes, and many other species. This 44-acre Sanctuary is named after an endangered mint plant, Dicerandra thinicola, also known as the Titusville mint. When the shrub blooms in November and December the tiny flowers put on a purple and white show. The sanctuary is 44 acres in size and has about a two mile loop trail through the property. The eastern edge of the property is dominated by a depression marsh. Look for songbirds in the trees along the edge of the marsh while at the same time keeping an eye out over the marsh for egtrets and the occasional sandhill crane. From the primary trailhead off of Mellisa road following the trail to the right takes you along this marsh. Soon you will come to an intersection to a trail that takes you up to the top of the scrub ridge. Near the top keep an eye out for Florida's only endemnic bird species, the Florida scrub jay. Rufous towhees, blue jays, various species of woodpeckers, raptors and other species are commonly seen here. From I-95 take SR-50 Exit 215 east 3 miles. Turn right on Key Largo Drive, go 0.4 miles and turn right on Karen Drive. Go less than 0.1 mile, turn right and go to the end of Melissa Drive. Enter on foot. From US-1 Take SR 50 .7 miles to the west and turn left on Key Largo, go 0.4 miles and turn right on Karen Drive. Go less than 0.1 mile, turn right and go to the end of Melissa Drive. Enter on foot. The Titusville Wellfields Trail is a multiuse trail of about 2 miles in length that winds through the City of Titusville's South Area Wellfields, which are situated within 300 acres of mature scrubby forest. The trail is open to bicycle, wheelchair and pedestrian use. The South Area Wellfields are adjacient to the Dicerandra Sanctuary and are home to the largest single population of Dicerandra Thinicola or Titusville Mint, a plant species that grows in very limited areas of Northern Brevard County and nowhere else in the world. The Area around the wellfields trail is aloso home the gopher tortise, indigo snakes, bobcat, raptors, songbirds, turkey, grey fox, and many other speices. To access the wellfields trail, park at Wuesthoff Park across Barna Avenue, and pick up the trail there. It then crosses Barna and enters the wellfields next to the City Fire Department. The wetlands park is located on the south side of State Road 50 just west of the I-95 interchange. A remote operated gate is often drawn across the entrance to the plant but a button is mounted on the left side of the access road. Pushing this button will alert a city employee who will open the gate for you. After signing in at the office, proceed to the back of the plant section to the entrance of the raised berm road which surrounds the wetlands. The wetland area is open to the public, Monday through Friday from 7 a.m. until 3:30 p.m. If you wish to visit the wetland area on the weekend, you must call the Blue Heron Water Reclamation Facility to make an appointment, (321) 383-5642. Follow the raised berm road to the right to begin the tour. Some of the more noteable species found here are sandhill cranes, which nest here, heron species such as great blue, little blue, green, and night herons, snowy and greater egrets, ducks, coots, rails, comorants, anhingas, and many other aquatic bird species as well as otters, alligators, and turtles. Whitetail deer have also been spotted here. 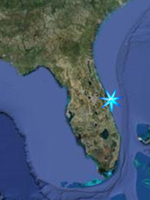 This area can be accessed from a parking area on the south side of SR 50 approximately three miles west of I-95. Canaveral Marshes Conservation Area is a 6,741-acre property owned and managed by the St. Johns River Water Management District. The trail from here heads due east for about a mile then turns due south for about another mile until it meets the Addison Ellis Canal, then follows along the canal east until it comes to the border of the Great Outdoors Golf and RV Resort. along this route this elevated dike trail trail offers expansive views of the marshes, which provide habitat for a diverse population of wildlife, including numerous migratory and resident wading birds and waterfowl, alligators, and many endangered species. Once you get to the point where the canal enters the resort, the trail turns south and forms two loop trails which take you through wooded hammock habitat providing habitat for various songbird species, deer, turkey, and other wildlife, while looping around an extensive indian midden. There is no camping or hunting allowed here. At the west end of Fay Bvld in Port St John, this 192.7 acre park has a 27 acre lake on the property, walking trails, shaded pavillions, and offers the chance to see wading birds, migratory songbirds, deer, and many other species. FROM US Hwy 1, take SR-528 east 2.7 miles, turn left onto Courtenay Parkway (SR-3) and go 1.8 miles. Turn left on Hall Road. The park site is on the left. Mitchell Ellington Park is a 114 acre park that features athletic fields and a playground. However there are wetlands on the nort section, wetlands and woods on the east and west as well as two ponds in the center of the park that provide chances to see song birds, deer, waterfowl, alligators, raccoons, squirrels and many other species. These areas are connected by an ADA Accessible Pedway allowing a chance for the mobility challenged to enjoy some of the area wildlife. ADA ACCESSIBLE: Parking, Pedway, Restrooms, Pavilions, Playground.